1. 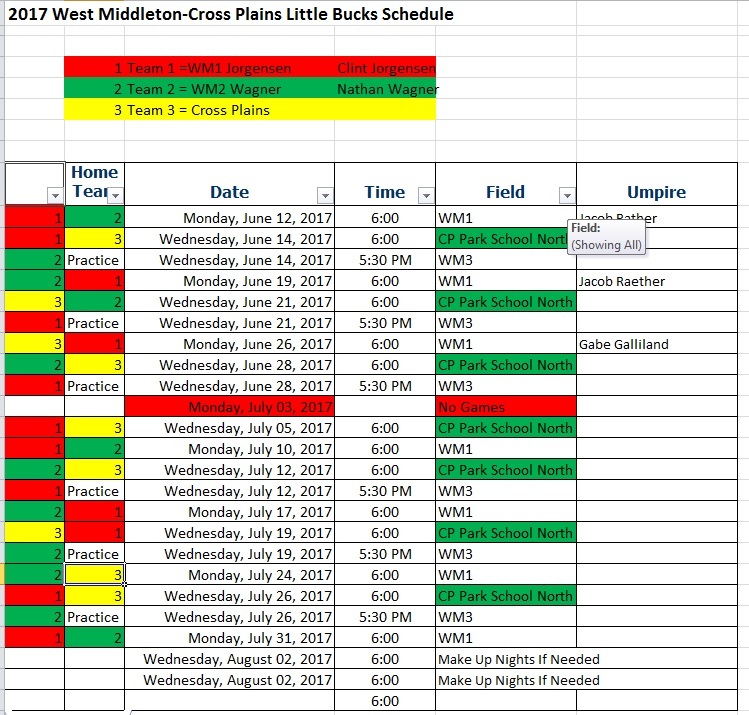 Team in the Little Bucks Program can play on Monday, Wednesday and Friday. The season typically begins the second Monday of June. 2. The season typically runs for 7 weeks. Game times can be at 6 or 8PM. 4. Games will be six (6) innings in length with a 1-hr 45min time limit. No inning shall start after 1 hr and 30 minutes to make sure games stay within the 1 hr 45 minute limit. 5. All players present at the beginning of the game will be in the batting order, regardless of number. Players arriving after the beginning of the game are added to the bottom of the batting order. 6. Each player should play at least two innings on defense. An inning consists of 3 outs. 7. No player may pitch more than three (3) innings per game. Two of which must be consecutive. If a player throws one pitch in an inning that act constitutes an inning pitched. 8. There is no bunting or stealing under any circumstances. 9. A runner may not leave the base until after the ball reaches the plate or is hit by the batter. 10. The catcher does not have to catch the third strike. 11. A runner is permitted only one base in addition to the one he is proceeding to on an overthrow that goes out of bounds. 12. All batters, on deck batters and base runners must wear helmets. 13. A game suspended for any reason shall be considered a suspended game and it will be resumed from the point of interruption. If 4 innings have been completed a game will be considered complete. 14. Ten players may play in the field (4 outfielders). 15. No more than 10 players can bat in any half inning. The offensive team shall notify the defense when the 10th batter comes to bat. The tenth batter will absolutely be the last batter, the tenth batter can not walk. The tenth batter must continue to bat until he puts a fair ball in play. If the tenth batter does not make the third out at first base nor does a base runner become the third out, play will continue until the batter is out on the base paths or is forced at home by a defensive player touching home plate with the ball in their possession and prior to arrival of the batter. Should an overthrow go out of bounds, while making a play on the tenth batter, play will halt, each runner will be awarded one base in addition to the one they are proceeding to and the inning is over.